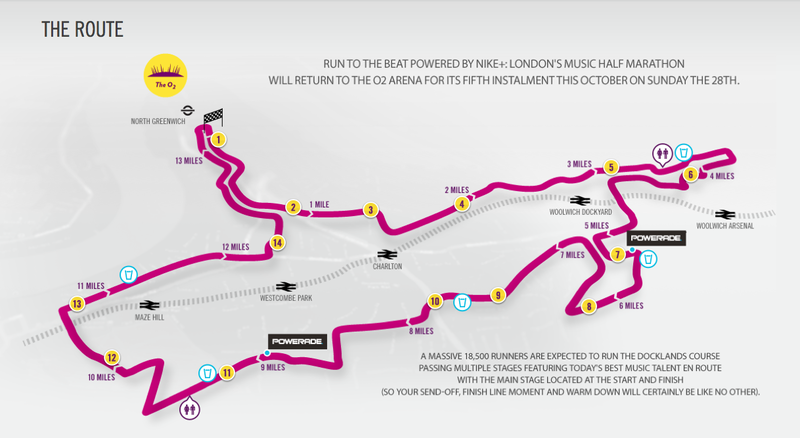 Britain’s unique music themed half marathon with 14 music stations, starting from The O2, around the Royal Borough of Greenwich, Greenwich Peninsula, finishing in The O2. Not great. Nike again did a terrible job of organised events. Such a shame as it lets down everyone’s experience of what should be a great day and many a first for people. Spectators clogging up paths, that I was waiting and not even moving in a crowd to get to baggage, then further mess in the baggage area, not clearly signed, I felt sorry for those needing the washroom, only minutes to go and queues were not moving. And the signage around the course was so low down, you could not see what was coming ahead or pace yourself properly. Water was in plastic cups, and everyone was forever queuing in the middle of the race itself! My own run – I decided by waking up to see how I felt. At 3miles, my hips were in pain, and then spent the rest of the race in pain. Not a pleasant run at all. First time I have not enjoyed a run. I usually cheer back the crowds for coming out to support in the cold for hours, high five kids enthusiastic mitten hands, and dance and wave to the music, Or what I love – take in the scenery and surrounding as I pep and motivate everyone around me, but instead, I was in much pain, i was heads down as I had to have stoppage so early on, and after the 3rd mile, I was an off and on scenario through gritted teeth. I was on time through out a fast pace till it kicked in, and watching the minutes go past towards the end, but I picked up at the 12th mile resulting in 2:29:50 – but it wasnt the quality of the run, it was the fact I felt glum afterwards, where I did not enjoy the run today. Sigh. Dry day. Very very cold for others. Again. Such a long wait to queue for your pen, then queueing again for the walk to the start. I was fine, but I could see others were very unwell and suffering the cold. I knew to layer up with base layers. What has crossed my mind and come out from today, is that I finished with a good steady pace, was sensible to walk when I was in pain, and listened to my body. No more races for this year 2012. Thats me done. My body is screaming at me to stop. 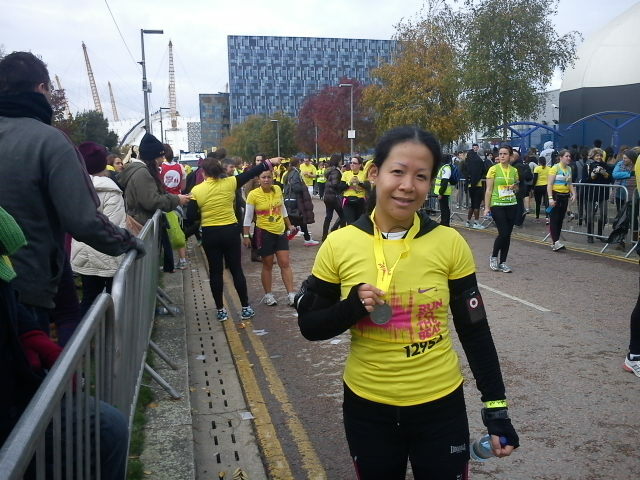 So here’s me, poorly, but still smiling and at least I tried and still didn’t give up, as my friends say. Thank you for the post support guys. Golly. Work completely picked up and was coming home from agency late hours and exhausted, with a packed weekend of boxing fights and work, that I managed to get self down to an empty gym, and do 34mins before I was in pain. 34mins better than nothing. Just good to get into an empty gym and do a workout with all pressures off. Been looking at what trial running is about and reflecting about my hips as well, long term. My Run To The Beat race pack has arrived. Have thought about changing how I post. Each training session per post, which would allow easier readership, however I don’t know how interested people would be in the shorter posts, and may end up as updates rather than posts. How am I feeling? 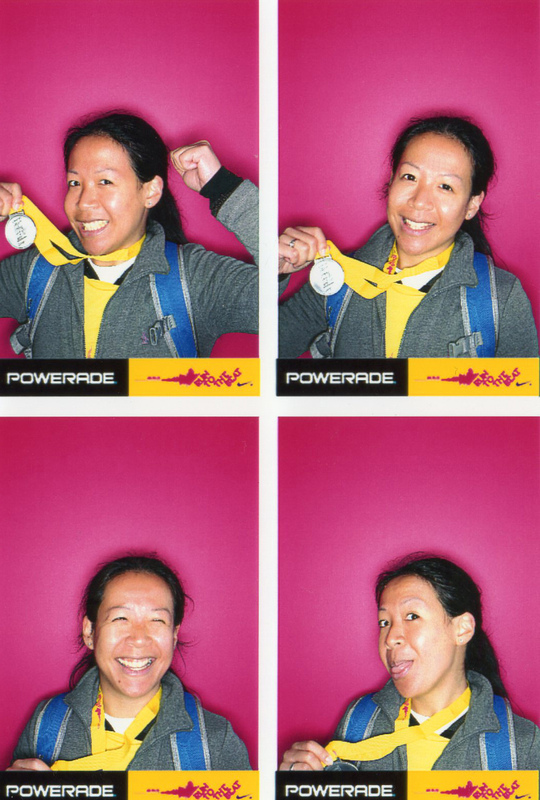 This would – if my inured hips allow, be my 4th half marathon completed. What did the GNR2012 teach me? That we push boundaries and test how far our bodies can go. I have since rested, and tested an indoor run, with not much luck. I am getting fed up. But I’m not one to stop training altogether. My friend MG did the Royal Half parks and I remember that fondly. A gym buddy came out the gym and as I had glumly said I only managed 10mins, he replied back, “But you did 10mins!” and I watched as I reflected about why I run, and what makes me run. Are all athletes sadists? Do I expect pain each workout, to know I am working hard? Do I aim for puddles of sweat around me, to know when to stop? He’s right. I am falling apart, and I did 10 mins.